I would like to introduce Maritza, our “trabadora.” Maritza is from a village called Catulaca, about 30 minutes from Gracias. She is 18 years old and lives with her mom and dad and ten siblings- yes 10! She is one of the middle children so she has plenty of experience with taking care of kids (although Emma may still be a challenge for her!) 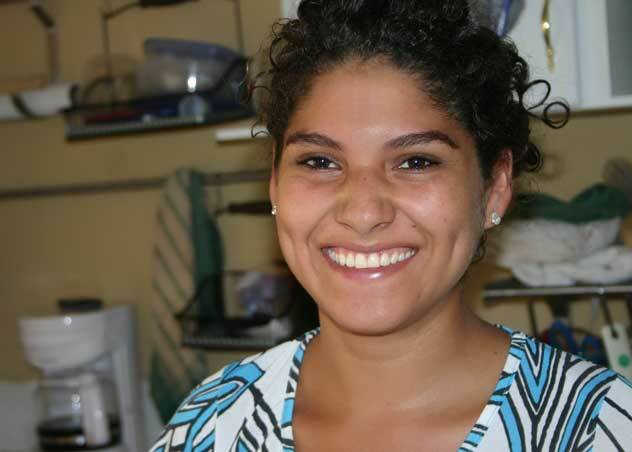 In Maritza’s village she does not have electricity or indoor plumbing. To spell that out, she uses a wood-burning stove, has no refrigerator, no kitchen sink, bathroom or clean water. They do have running water outside where showers are taken in something similar to an outhouse and dishes and clothes are washed in the same water they drink with. Her dad works in agriculture and her mom, of course, works at home taking care of 10 kids. Maritza will be living in a detached room at our house and help with the cooking, cleaning and adjusting to the culture here. She does not know English at all so this will also be a huge help in learning Spanish for the kids and me. In exchange for living with us we will pay her approximately $50 a month plus room and board. All of the money she makes will go directly to help her family. She will also get to continue her education here in Gracias (she goes to school on Saturdays only). In the States a trabadora would be equivalent to a Nanny/ housekeeper. Here it is customary if the woman works outside the home to have a trabadora. I am pretty sure I will love this custom! Please pray for Maritza as she adjusts to all the changes in her life. While we look at electricity and indoor plumbing as a great thing, it is a little intimidating to walk into. The biggest change for her and the thing she is the most nervous about is living with a family who can barely talk to her while being away from her family. Please also pray for our family as we adjust to having her here and me going to work. I have not worked outside the house since Tyler was born so this will be a huge change in the structure of our home. I start school Thursday and the kids will be staying with Maritza after that. They are nervous about being left with someone they can’t communicate with so please pray for them. On a different note, we were at a house church last night and I looked over and Tyler was playing tick-tack-toe in the dirt with a group of boys. Then they taught him a couple games. The last couple days have been an encouragement to him. Sunday he also played with some kids at a different house church. Many of you elders probably played this game when you were younger but he had never seen it. One boy stood at the top of the hill and rolled a wheel down the hill to another kid. Tyler loved it! Thanks for your prayers regarding our kids. They are defiantly helping! One other side note- we ate at a hole in wall restaurant today while our truck was being worked on and it cost us a total of $2.50 for all of us to eat. So cheap and we haven’t even gotten sick from it yet!